the canDIshhh tales: Goodbye Cocomo Nails.. I will MISS YOU!! I got a text message last Thursday. The text said that my favorite nail salon will be closing down on August 23, 2010, so for those who wanted to set an appointment are welcome to do so before the close down. I called immediately and made an appointment. This is my FAVORITE nail salon in Metro Manila, and even if I live in Quezon City, I make it a point to go to Greenhills just to have my pedi done here at this nail salon. I can say that I am one of the pioneers, as I have been with them since they opened. The staff is superb. They're all smiles, and the aura of the salon is wonderful. The place is huge and spacious! I am always at ease, plus everyone is poilte and courteous. Everyone makes you feel at home, everyone greets you with a smile and says bye when you leave. I am saddened that they're closing shop. I will miss going to Cocomo Nail Spa every two weeks. I will miss seeing the friendly faces. Thank you Cocomo! Thank you Monic! Thank you Tessa!! To those who don't know yet, please make your appointments now! This is so sad. 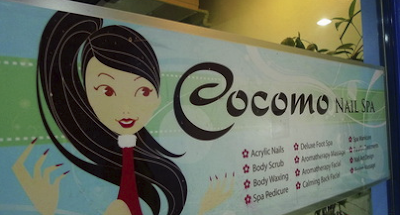 It's so hard looking for a nail salon with the kind of satisfaction at Cocomo Nails Spa gives.